Toasterpult! Oh my God, a toasterpult! Finally! All I need is radioactive bread that bounces twice, then sticks to scenery and explodes, and I can recreate MDK2! Y'know, apart from the four-armed gun-wielding robotic dog, or the guy in the rubber suit with the physics-defying parachute and the giant pointy thing. So, mostly Dr. Hawkin's parts. Except for everything else. So, only the toast. And the clothes. And I'll stop now. If it's not called The Toasterpult or The ToastCannon or something similar, I'll be disappointed. You are so win for the MDK2 reference. So. Win. Thank y' kindly. One of the few games I've finished (I have a severe case of Attention Deficit... Ooh, Shiny! ), and I enjoyed every minute of it. Agreed MDK2 was such a great game. I don't need luck, I have science! I really want a toaster like this. I don't even care about the toaster. Kudos for the H2G2 reference. 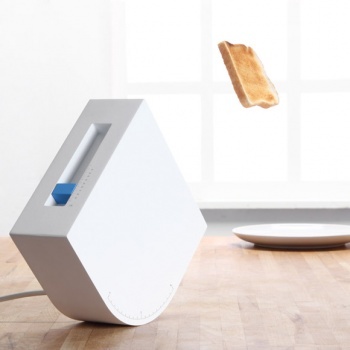 Well, if you look closely, the toaster is obviously massively important. What angle does it shoot your toast at? You throw your toast out of a first-floor window every morning? Why? To see the butter flies? Butterflies are bread, not made! How foolish of me! Now it just needs to burn "What do you get when you multiply six by nine" into the toast and they've got a sale. I strap it to the cat, if toast always lands butter side down and a cat always lands on it's feet, will they both land on their side? Those are terrible, terrible puns and you should be ashamed. I could just be punishing you. Does it land on the sand-wich-es there?